Over the past 15+ years, Molecular Media has strived to stay at the vanguard of the technology offered to our industry. Our business relies on stunning imagery and crystal-clear audio to create the perfect learning atmosphere for our clients. Cavernous hotel meeting spaces that are stacked on top of each other can often pose a problem for our audio technicians when building out complex audio systems. Feedback, cross-talk and signal interference are always on the forefront of our Molecular technician’s minds, and discovering sound (pun intended) solutions is a top priority. Shure Americas has been the frontrunner when it comes to professional audio equipment since 1925, and 2013 is no different. 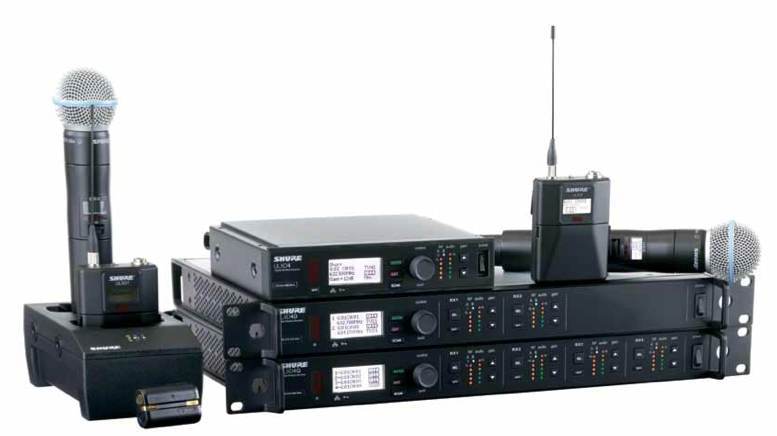 This year Shure introduced the ULX-D Wireless Audio System as an answer to the audio difficulties our industry faces. With a dramatic increase in spectrum efficiency, dependability and signal routing, the ULX-D promises to cut down on outside interference and increase the signal strength in even the most signal-congested of environments. One of the most exciting aspects of the new equipment is the improved encryption of the streaming audio. Molecular Media often works within verticals where security of the content is of vital importance, so additional security is always appreciated. In addition to making things more secure with the new encryption functionality, this added layer of protection brings piece of mind to both our technical team and our clients. So what does this mean for the customer? While the Molecular Team has always ensured that the audio we deliver is free from interference and is output at the highest quality, this new technology will allow us to focus more on the other elements that make our clients’ events great. It will also allow us to utilize less equipment and still offer multiple crystal-clear channels. Less equipment, better audio and easier set-up means our techs are able to focus more on the content and less on the delivery. Visit our archives. . .
© 2019 Molecular Media, Inc.